Core Tip: In the weak consumption, the supply is not a big tightening of the case, the copper price will not continue upward, is expected next week, the main shock is expected next week, Shanghai copper operating range 45600-47100, copper copper 5650-5900, scrap copper 40600- 41600. 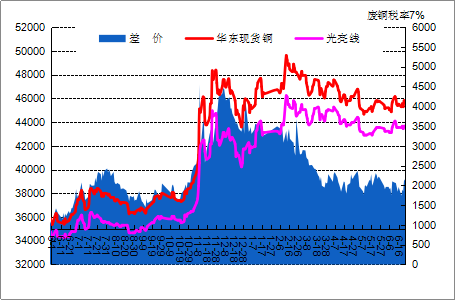 Spot copper price volatility this week is not large, the rate of change in the 500 yuan or so. However, it should be noted that Friday evening Shanghai copper appeared a wave of rally, making the Shanghai copper operating range expanded to more than 1,000 yuan. This week the domestic spot copper market once again showing an oversupply of the state, on the one hand is due to the spot copper supply side increased this week, more important reason is due to the demand side began to gradually deteriorate the situation. From the spot copper premium situation can also be clearly seen that this week, good copper premium has reached 100 yuan above, so that a large amount of premium and did not appear in 4,5 months, showing that the domestic copper supply and demand contradiction There are signs of re-intensification. As the Fed last week to raise interest rates after this week, the macro environment has returned to calm the situation, so the demand side of the performance will clearly affect the follow-up trend of copper, the upcoming consumption of the traditional low season, the copper price fear can not be too optimistic. Copper prices this week to maintain a narrow range pattern, the upper and lower space are more limited. Week market operators are also holding more shocks view, so the weekly cargo holdings rallies will not be low, the market supply and no performance is very rare, and traders are also more active in moving goods, so the market activity is still acceptable. But the manufacturers are not satisfactory, from a certain extent by the impact of the consumption of off-season, manufacturers get goods enthusiasm has been worse, every fall is the pressure to enter the market to buy goods operation. Environmental protection, the national scope of the census has obvious signs of weakening, but some areas of the focus of inspectors but not see the increase, Beijing and Tianjin and the surrounding areas is still the hardest hit, many small and medium-sized manufacturers are still in the closed state, the market Supply to the surrounding provinces and cities outflow. There are some signs of expansion in the near future, but the advantage is not obvious, so it is expected that the supply of scrap copper will not have a significant impact on the refined copper market. This week, copper prices shock upstream, Shanghai copper has now exceeded two weeks before the rebound high 46600, to reach 100 moving average near. China's industrial added value in May above the scale of 6.5% growth, unchanged from the previous month, the overall good. 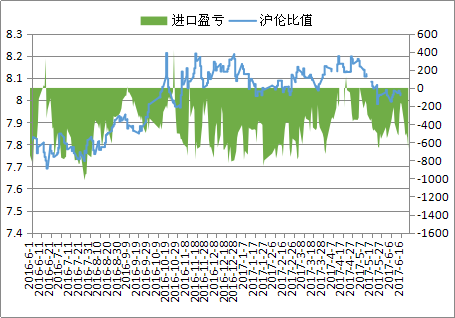 The recent tightening of funds, although the central bank today to continue the tender to reverse the purchase operation, but still tight monetary policy. MSCI (Morgan Stanley Capital International) announced on the 20th, from 2018 on the Chinese A shares into the MSCI emerging market index, which long-term positive for China's stock market, indicating that foreign countries continue to be optimistic about the Chinese economy. Foreign, the Eurostat data released last week, the euro zone May CPI in line with expectations. Lower inflationary pressures mean that the ECB can not quickly withdraw from the extremely loose monetary policy. So there is no basis for raising interest rates in the short term. Europe's economy to the good, the formation of copper consumption to support. The United States to June 17 when the number of claims for unemployment benefits 24.475 million, the forecast value of 243,000 people, indicating that the labor market is still tight, the labor market is related to the next rate hike schedule. Yesterday the International Copper Research Organization (ICSG) in the latest monthly report said that in March the global refined copper market shortage of 5,000 tons in February for the surplus 102,000 tons. In addition, the first three months of this year, the global refined copper market surplus 164,000 tons, the same period last year for the shortage of 12,000 tons, the overall view of the supply side has improved. Inventory: LME copper stocks fell to 264,175 tons, for the fifth consecutive trading day decline this week. Today announced the May import and export declines, of which imports 265,053 tons, down 16.97% year on year. In general, the consumption is weak, the supply is not a big tightening of the case, the price will not continue upward copper, is still the main shock, is expected next week, Shanghai copper running range 45600-47100, copper copper 5650-5900, scrap copper 40600 -41600.